Let's officiate dis blog by reminiscing about my holidays. I love to travel but it's more to shop for great stuff rather than sightseeing. 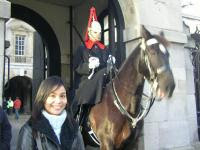 In December 2006, my family & I went for a holiday in London & Paris. The trip was great although it was freaking cold that time. 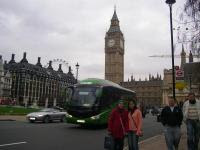 If you happen to be visiting London, I would advice you to stay @ the hotel near to the Victoria Station. 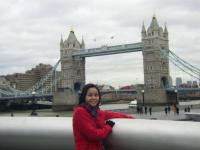 It's easier for U to travel using public transportation (tube & bus). Believe me, it's nothing like the public transport in Malaysia. 1 thing is dat you juz have to learn how to read the guide. Hmm shopping? 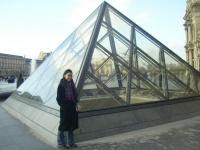 I didn't shop in Paris coz it was expensive but we went to Le Champ Elysees for window shopping. In London, mostly we shop @ Oxford Street. Harrods? Emm... we only shop sounvenires there. This is my sis & I at the heart of London. This is Adam. He was staying there at that time & kind enough to take us sightseeing. Now he's already back in KL. 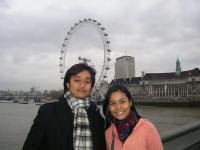 Behind us is the 'London Eye'. I didn't ride it though coz I reckoned it was expensive. Would rather save my money for shopping. As usual, typical me. guards. Simply adore the horses. They could juz stood there quietly for hours. 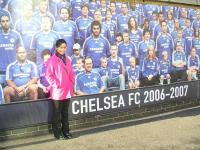 We went to Chelsea coz it was the nearest from our hotel. I don't watch football ok. So save ur comments bout Chelsea. In Paris. Recognize this so-called pyramid? Yes, it's in 1 of the scenes in Da Vincci's Code movie.